Harvard faculty celebrate Houghton Library’s 75th anniversary with a masterclass on its outstanding collections. Nearly 50 academics in fields ranging from astronomy to government reveal Houghton treasures of personal and professional significance. From a wanted poster for Lincoln’s assassins to Charlotte Brontë’s childhood handmade miniature books, the assembled objects represent formative encounters from their student days and careers at Harvard, and the inspiration behind countless publications, including a Pulitzer Prize-winning bestseller. Each year, Harvard faculty lead hundreds of class sessions at Houghton, introducing generations of students to the learning and research potential of the university’s rich and varied special collections. Their ever-evolving perspectives constantly invigorate collections in the library’s care. 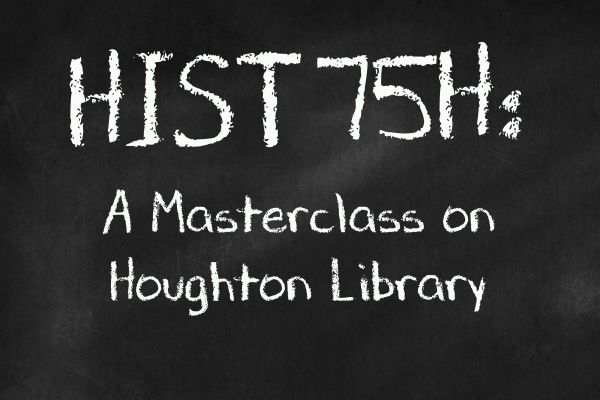 Houghton Library invites you to take part in this masterclass with Harvard’s world-renowned teachers and scholars by choosing your own track through this exhibition. We hope they inspire you to have your own encounters with the collections in the reading room, seminar rooms and online.